Many questions based on the newly appointed brand ambassadors are seen every year in MBA entrance exams like SNAP, XAT, IIFT, MAT etc. It is a scoring topic and accuracy can be achieved here. 1-2 questions can be seen on this topic almost every year in these exams. 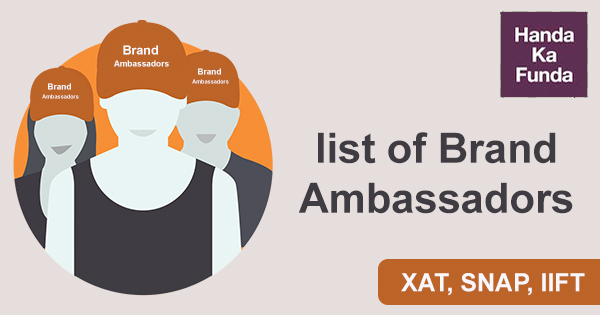 We have provided a list of the most important brand ambassadors that have been appointed in 2018. In the table, we have a short description of the brand along with its ambassador using which the question can be formed indirectly. Enjoy reading! 2. Mastercard M.S. Dhoni Mastercard Incorporated is an American multinational financial services corporation headquartered in the Mastercard International Global Headquarters in Purchase, New York, United States. 3. Dabur Honey Jacqueline Fernandez Dabur is one of the India’s largest Ayurvedic medicine & natural consumer products manufacturer. Dabur demerged its Pharma business in 2003 and hived it off into a separate company, Dabur Pharma Ltd.
5. Philips India Virat Kohli Koninklijke Philips N.V. is a Dutch multinational technology company headquartered in Amsterdam currently focused in the area of healthcare and lighting. It was founded in Eindhoven in 1891 by Gerard Philips and his father Frederik, with their first products being light bulbs. 8. Assam’s Brand ambassador Hima Das Hima Das, nicknamed the “Dhing Express”, is an Indian sprint runner from the state of Assam. She holds the current Indian national record in 400 metres with a timing of 50.79 s that she clocked at the 2018 Asian Games in Jakarta, Indonesia. 10. Swachh Bharat Mission in Ghaziabad City (Uttar Pradesh) Suresh Raina Swachh Bharat Abhiyan or Swachh Bharat Mission is a nation-wide campaign in India for the period 2014 to 2019 that aims to clean up the streets, roads and infrastructure of India’s cities, towns, and rural areas. Suresh Kumar Raina is an Indian international cricketer. An aggressive left-handed middle-order batsman and an occasional off-spin bowler, he is also regarded as one of the best fielders in world cricket. He plays for Uttar Pradesh in all forms of domestic cricket. 11. Road safety awareness campaign Akshay Kumar The campaign targeted all road users including pedestrians, cyclists and pushcart drivers. The main objectives of the campaign were to raise awareness on the causes and effects of road accidents and sharing of strategies that can be employed to minimize accidents. 14. AMAZE(Luminous POWER) Virat Kohli Luminous Power Technologies is the leading power and home electrical specialist in India having a vast portfolio comprising of Power back up solutions such as UPS, Batteries and Solar Applications to Electrical offerings such as Fans, LED Lighting, Switches and Wires. 16. SHARP TV Rohit Sharma The Sharp Aquos is a range of LCD televisions and component screens made by Sharp Corporation of Japan.its televisions in India are distributed and sold by Reliance Industries’ retail arm, Reliance Retail. 17. Dollar Missy Chitrangada Singh Missy is the leggings brand of Dollar industries. 19. ‘Educate Girls’ Katrina Kaif Educate Girls is a non-profit organization in India that aims to tackle issues at the root cause of gender inequality in India’s education system. Founded in 2007 by Safeena Husain, the non-governmental organization has its management and outreach office in Mumbai and operations in 10 districts across Rajasthan and Madhya Pradesh. Sushant Singh Rajput The Whirlpool Corporation is an American multinational manufacturer and marketer of home appliances, headquartered in Benton Charter Township, Michigan, United States. CEO: Marc Bitzer.Whirlpool Corporation is the world’s largest home appliance maker.It developed freeze-dried ice cream in 1968 under contract to NASA for the Apollo missions. 22. Vivo Aamir Khan It is a Chinese technology company owned by BBK Electronics that makes smartphones, smartphone accessories, software, and online services. It was founded in 2009 in Dongguan, China. The company develops software for their phones such as the Vivo App Store, iManager included in their proprietary Android-based operating system called Funtouch OS.Vivo unveiled a concept smartphone named Vivo “Apex” at the Mobile World Congress 2018. The concept phone features a high screen to body ratio (91.2%), pop-up front camera and two optical fingerprint scanners under its OLED display.The production version was named Vivo Nex. 23. Dream11 MS Dhoni Dream11 is a fantasy sports platform based in India that allows users to play fantasy cricket, football, kabaddi and basketball games. It was co-founded by Harsh Jain and Bhavit Sheth in 2012. In 2014, the company reported 1 million registered users, which grew to 2 million in 2016 and to 30 million in 2018 It is a member of the Fantasy Sports Trade Association (FSTA) and is the founding member of the Indian Federation of Sports Gaming (IFSG). 24. Brand ambassador of Sikkim AR Rahman As the brand ambassador, Rahman will promote and project the state’s achievements nationally and globally. 25. Muthoot Group Amitabh Bachchan It is an Indian multinational conglomerate headquartered in Kochi, Kerala. It has interests in Financial Services, Information Technology, Media, Healthcare, Education, Power Generation, Infrastructure, Plantations, Precious metal, Tourism, and Hospitality. The Company was set up by Muthoot Ninan Mathai in 1887 at Kozhencherry. 27. Cox and Kings Anushka Sharma Cox & Kings Ltd., set up in 1758, is one of the longest established travel companies. Headquartered in India, the holiday and education travel group has subsidiaries in the United States, Canada, the United Kingdom, Netherlands, the United Arab Emirates, Japan, Singapore, Australia and New Zealand. Historically, Cox & Kings Ltd. has been an army agent, a travel agent, a printer and publisher. 29. Nokia Alia Bhatt It is a Finnish multinational telecommunications, information technology, and consumer electronics company, founded in 1865.Nokia’s Indian subsidiary has been charged in January 2013 with non-payment of TDS and transgressing transfer pricing norms in India. 30. HoloSuit Yuvraj Singh HoloSuit is the world’s first affordable, lightweight, bi-directional, wireless and easy to use full body motion capture suit. With options for 26 or 36 embedded sensors and 9 haptic feedback devices dispersed across both arms, legs, and all ten fingers combined with 6 embedded buttons – HoloSuit captures the user’s entire body’s movement data and uses haptic feedback to send information back to the user, for scenarios including sports, healthcare, education, entertainment or industrial operations. This was a list of the most recent appointments. Check out our course on GK for various MBA entrance exams and detailed documents on some of the GK topics available on our website. We have tried to make the list comprehensive, but if you feel that we have missed something important, then please mention it in the comment section below.